Listen to Animal Radio LIVE anytime with the FREE Animal Radio App for iPhone / Android. Plus, you'll get notifications anytime there is a recall or news that effects you and your pets. 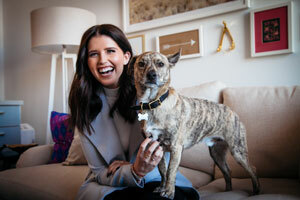 Katherine Schwarzenegger (daughter of Arnold and Maria) is an ASPCA Ambassador and bestselling author. She has a new children's book, which will empower young readers to help dogs who find themselves in shelters and animal rescues. She's our guest this week. A USA Today article cited lots of research and experts both for and against dogs licking humans on the lips. For example: There are more than 700 different types of bacteria in a healthy dog's mouth. One doctor researching this subject says she's heard many personal stories from people on both sides of the spectrum, including one who claimed their dog's kisses healed them from skin cancer and another who believes dog saliva caused a family member's death. Millennials are behind the idea of pets as family members and making animals' lives better. A new survey shows that for Millennials (those between the ages of 18 and 36) pets really are like their children with one-third of them, who purchased their first home, doing so because it had a yard and was a better space for their dog. Only 25% of Millennials bought their first home because they got married and 19% because they had children. Buy a Salad - Get a Pet! A southern California woman has a new pet frog after finding the distressed amphibian in a large container of lettuce mix she bought at a local Target. She had already made her salad, poured on the dressing and was just about halfway through eating it when she saw something in her bowl that was moving. Being a strict vegetarian, the woman says she was so traumatized after finding the frog in her salad and that she has no desire to eat salad ever again. However, she quickly scooped up the little frog and rinsed off the dressing, but she noticed the frog was barely alive so she did chest compressions on it - frog CPR - and it survived. His name is now Lucky. 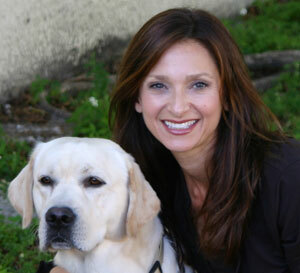 Dr. Lisa Radosta, owner Florida Veterinary Behavior Service explains what causes fear, anxiety, and stress in our pets? How does this fear, anxiety, and stress affect them? Why is it so important that we address the fear, anxiety, and stress in our pets? What is one simple thing we can do to reduce fear, anxiety, and stress in our pets? 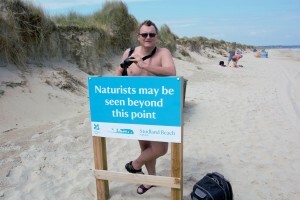 Olaf Danielson has made a hobby out of birding without any clothes. Olaf is an author, religious scholar, storyteller and adventurer. He will share some of his favorite stories of seeking out rare and exotic avian wildlife... while naked as a jaybird. Who is Tracking Your Pet Purchases? With the pet industry growing so fast, any information that can be gained from your purchases for your pets is going to be extrapolated every way possible for those companies which profit from your spending habits. Search data pulled by Hitwise from major pet supply websites in June shows the majority of both cat and dog owners, or at least those doing the buying for their pets, are women and that the women who own dogs make nearly twice as much as those who have cats. A pet cemetery and crematory in Illinois is accused of deceiving clients by giving them ashes that were not be from their deceased pets. Police found three deceased animals inside an old freezer at the facility and fortunately one of the animals had been micro chipped. Authorities contacted the owner who said they had already received their cat's ashes. But the only thing illegal in this case was misrepresenting ashes of an animal because pet crematories in Illinois are not regulated. Are Kittens and Puppies The Key to a Successful Marriage? You're thinking love, communication, trust, common interests and that kind of stuff, right? But, a new study from the University of Florida says it could also be cute, cuddly puppies, kittens and bunnies. The team of psychological scientists found that to break the 'familiarity breeds contempt syndrome' or boredom that can happen in long-term relationships, couples can make better associations with their spouse through a positive stimulus like puppies and bunnies. 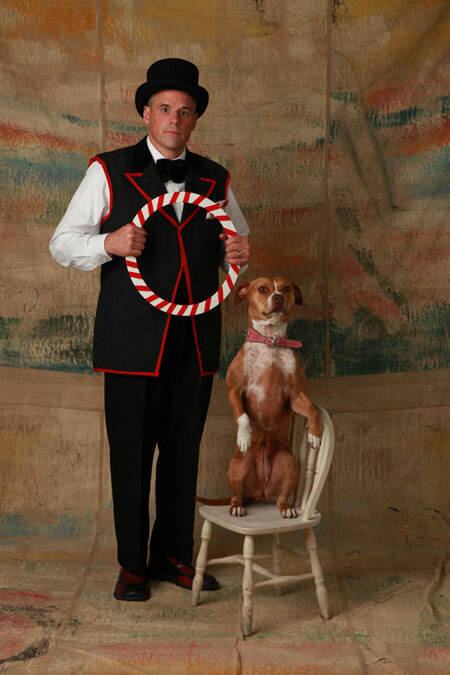 Jeff Jenkins is the ringleader for the Midnight Circus, a pit-bull agility performance that shows the often-misunderstood dogs in a positive light. He's helping youngsters train their pit-bulls to do tricks instead of fighting. Shellie Powell has an unusual pet. 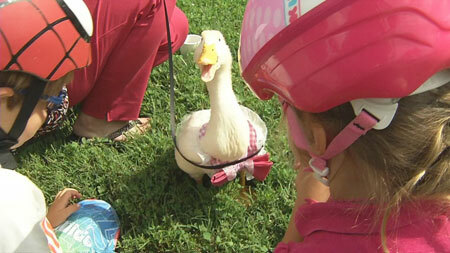 She is the proud guardian of "Diva," a pet duck that wears a diaper and shoes. Diva goes with Shellie everywhere, including Walmart, Target and PetSmart. Shellie is training Diva the Duck to be a Therapy Pet. Many veterinarians are practicing "Fear Free." Pets that like going to the veterinarian are generally healthier. Now, the Fear Free movement is coming to your home with ideas for enriching your pet's life everyday. Dr. Marty Becker is back to explain how your pets can live an improved lifestyle. Can Kissing Your Pet Make You Fat? Researchers are looking into the connection between having a pet and obesity. They are interested in gut health and trying to find out if certain microbial swaps (such as a kiss or a lick with your pet) might help or hurt when it comes to weight problems in both pets and people. Current evidence actually suggests heavier people have heavier pets, which some scientists believe could be due to microbial swaps from a human to a dog. The number of pet related fraud cases are on the rise. The latest is Texas where a woman's cat mysteriously disappeared from the front porch where he would take his afternoon nap every day. The day after he vanished, she put up fliers all over her neighborhood. Less than a week later, she received a call from a man who asked if there was a reward for the cats return. He then said she could get Romeo back for $300 and offered to finance the payments for 8 months! Your dog doesn't need to be in a hot car to suffer from heat exhaustion. Temperatures above 82 degrees are enough to cause a fatal reaction. 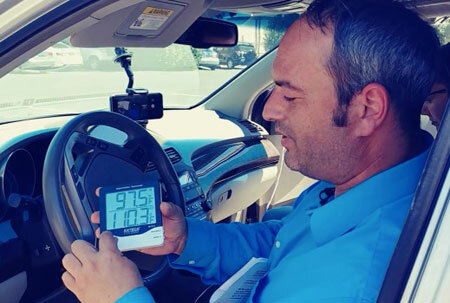 Steve Burdo from Contra Costa Animal Services sat inside his Acura as temperatures soared about 115 degrees. He did this to bring attention to the new California law that allows people to break into cars to rescue hot animals. We're giving away a dozen Brilliant Pad systems this week. 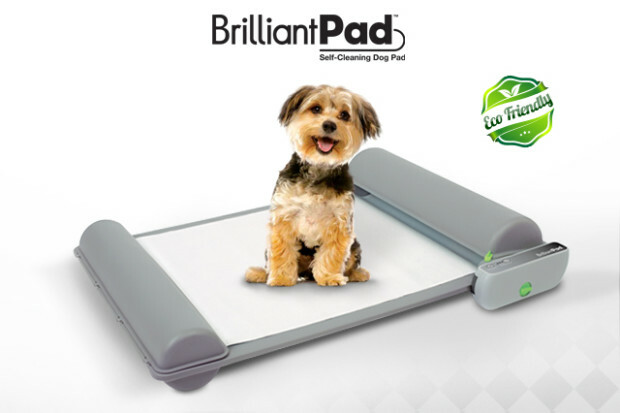 If you have a dog that weighs less than 25 pounds, you could easily win a Brilliant Pad Self Cleaning Dog Potty just by calling in. The catch? You have to report back how much you love it. Is There Arsenic In Your Pet Food? The Clean Label Project (CLP) just did a study of the top pet foods and found 16 times the lead of the Flint Michigan crisis. They also found Arsenic, Mercury, BPA and other toxins that aren't regulated. Could this be causing cancer in our pets? CLP's Jackie Bowen is our guest this week and she has answers that will shock you. Animal Radio's New Pet Product Special continues with giveaways of the latest and great gadgets and goodies for your pet. This week's pick is the Clever Pet dog puzzle. This incredible toy will keep your best friend busy and stimulate his noggin'. Can you even imagine finding out that a beloved pet you believed to be dead is actually alive? That's exactly what happened to the Coates family in Utah. Their boxer Zoey started having seizures last year when Mr. Coates took her to the vet to be put to sleep. Then Mrs. Coates went online to look for another boxer for her 11 year-old son, who had been very close to Zoey. That's when she stumbled onto a picture of Zoey saying she was in need of a foster home. Former Real Housewives' of Atlanta star Kim Zolciak-Biermann has now taken to social media to call out whomever it was that called Animal Control to make a report that she doesn't take care of her dogs. Even if you are not a fan of the 'Don't Be Tardy' reality mom, you have to know what a die-hard animal advocate she is. How Will The Eclipse Affect Your Pet? 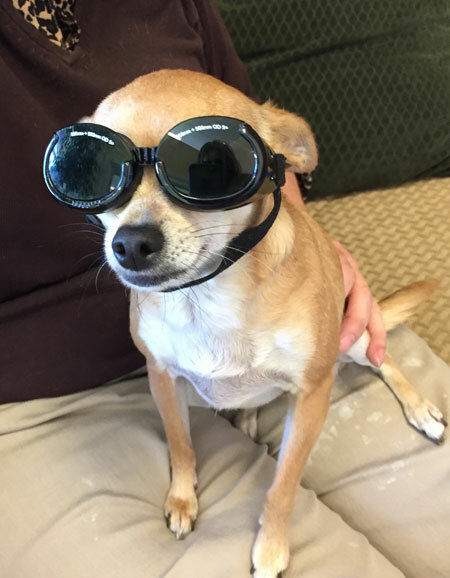 Does your pet need special glasses to see the eclipse? Will animals act strange during this astronomical phenomenon? Astrophysicist Dr. Angela Speck is our guest. She has answers to these questions and other ecliptic queries. Would Your Pet Be a Good Model? Marketing genius Amy Peller managed to launch her dog's modeling career in an advertisement for Banana Republic. She says you shouldn't quit your day job. But she also says it's a lot of great fun for her and her dog Benny Hanna. Pet World Insider Robert Semrow reports from the floor of SuperZoo, the pet product industry's largest trade show. He's reporting on the trends and Animal Radio's Top Picks for 2017. Alan Cook shows off his latest invention, a self-cleaning potty for dogs. Facebook is cracking down on the sale of pets, which they say is designed to weed out puppy mills. Facebook's list of things NOT allowed or forbidden commerce also includes weapons, ammunition, explosives and adult items or services. Private groups appear to be included in the no pet sales policy, so even those posts in private groups would be subject to removal. No doubt you remember Cecil the lion, Zimbabwe's beloved big, black-mane lion, whose death at the hands of an American trophy hunter triggered international outrage? Cecil, was of course, killed by an American dentist who had paid about $50,000 for the African safari. Now history is repeating itself. Cecil's son has been fatally shot by another trophy hunter in Zimbabwe. A cat cafe in Brooklyn has recruited a pair of rats to care for its newborn kittens. They are young rats named Remy and Emile. 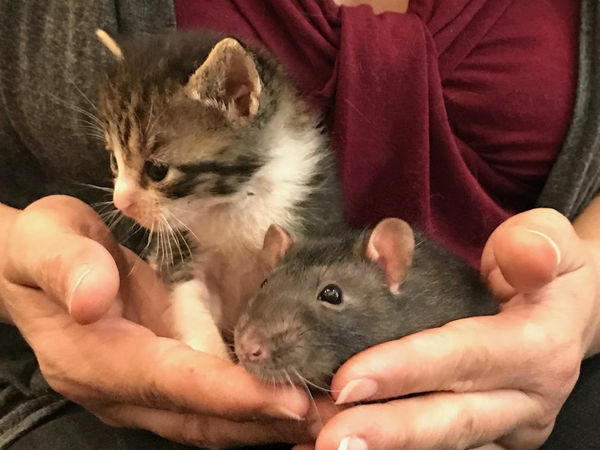 These special rats were raised around kittens from a young age and are mostly used to care for orphaned kittens, sometimes called "bottle babies." But, because the rats are not afraid of the kittens, the rats donâ€™t run away and the kittens mostly don't chase them, although they do love playing with the rat's tails during supervised play sessions. The Animal Radio App has been UPDATED and is better than ever. Download the free Animal Radio App for iPhone - Android - Blackberry. -Ask Veterinarian Dr. Debbie White and Dogfather Joey Villani your pet-related questions directly from the app. -Get up to the minute news and recall alerts. -Listen to current Animal Radio show or browse archives. -Call us directly on the Animal Radio App Hotline. You may already know how expensive pet medication can be. Especially when pet insurance doesn't cover drugs. Animal Radio® wants to help out. We don't want any pets to go without the medicine they need. Animal Radio® made a deal with the top pharmacies to save you up to 55%. 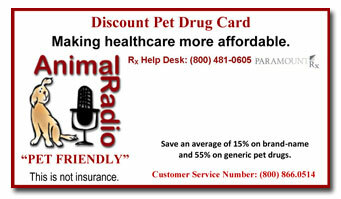 - The Animal Radio® Pets & People Drug Discount Card is FREE. - It offers 15-55% discount on pet medicines or uninsured human medicines. - It's usable at almost 60,000 pharmacies, including Walgreens, Wal-mart, Rite-Aid, Target, Costco, CVS...all the biggies! - Card is pre-activated and never expires. Please help spread the word. Your friends will thank you. Glynis McCants is a numerologist. She says there is a formula to naming your pet that will effect them throughout their life. Dr. Debbie is healing a tegu lizard with two penises. Sometimes that can be a problem. Michelle Hanson accidentally made a pet out of a tortoise, which apparently are high-maintenance animals. Woman are the predominant pet owners. This is part of a survey about your pet purchase habits. Why do Veterinarians have a higher suicide rate than dentists at four times the national population? So many ways to listen to Animal Radio®. 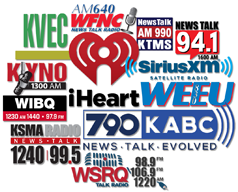 We're on 133+ AM/FM stations, the Animal Radio® App for iPhone/Android, iHeart Radio, iTunes, Stitcher, TuneIn, Spreaker and Podcast. We're available wherever you are! 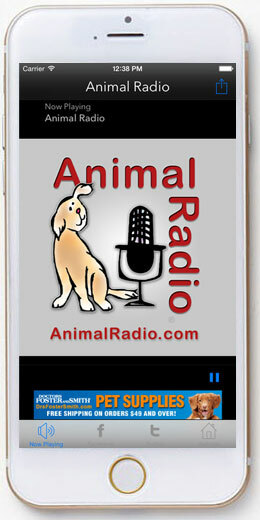 The Animal Radio® APP is available for Android and iPhone. Listen on your schedule. Ask our Dream Team questions directly from the App. It's a FREE Download! It's made possible by Drs. Foster & Smith. Copyright 2001-17 Animal Radio®, its logo and Animal Radio Network(TM) are registered trademarks of Animal Radio Network LLC. All rights reserved. Submissions for newsletter, programming, editorial comments and opinions may be sent to: YourVoice@AnimalRadio.com. See our website for additional information.